While Chrysler and General Motors had to go to Congress to beg for cash in 2008, every other automaker's finance arm was having trouble as well. Typically, once they lend money to a buyer, they sell the loan, get the cash upfront, then pump the proceeds back into the business. They also take out short-term loans called commercial paper that keeps the day-to-day business afloat. The crash cut the circuit, raising the chances the automakers couldn't make loans to buyers and keep selling new vehicles. That's where the Fed stepped in. In normal circumstances, the Fed only lends money to banks, leaving the decisions about who should get credit to them. But when the financial markets started to collapse in late 2008, the Fed set up several programs to lend money directly to corporations, a highly unusual step. 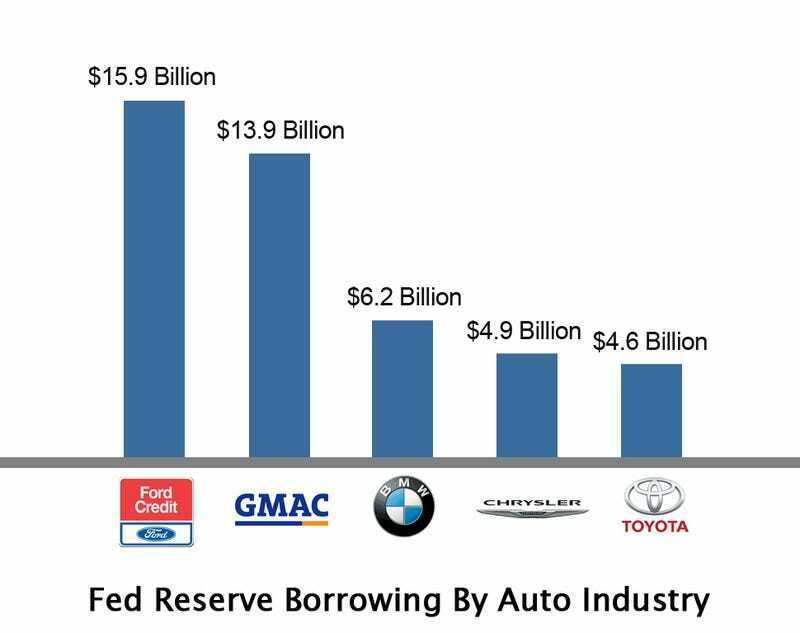 The Fed also lent $13 billion to investors who bought bonds backed by loans to new car buyers from automakers and banks. The Fed made clear that while investors got the loans, the move was meant to keep the lenders in business; the credit arms of Ford, Chrysler, Nissan, Volkswagen, Honda and Hyundai all benefited directly. Ford spokeswoman Christin Baker said the two programs "addressed systemic failure in the credit markets, and that neither program was designed for a particular company, or even a particular industry." Ford Credit has disclosed through SEC filings and conference calls with media and investors that it was taking part in both programs. BMW told Bloomberg that the Fed lending "supported our financial profile and offered us an additional funding source, especially at times when the money markets and capital markets did not function properly and efficiently." According to the Fed, the commercial paper loans have been paid in full, while some $2 billion remains outstanding on loans for bond investors. The secrecy surrounding the details of the loans only masked how much aid corporate America and Wall Street needed. While General Motors and Chrysler took the brunt of the blowback for relying on government handouts, the reveal of the Fed numbers show that a far bigger slice of the U.S. auto industry needed help.